I preached on Sunday at Pacific Lutheran University as a part of my work at Luther Seminary. I was anxious about preaching because of a few reasons: 1) I am not Lutheran and was afraid I’d mess up Lutheran theology; 2) I wanted to do well; 3) I wanted to represent Luther Seminary well; and 4) I wanted to honor the importance of Reformation Sunday in the Lutheran Community. Prepping took a lot of praying and a lot of breathing. It was good for me to have to face my insecurity and fear of failure. Here’s basically what I said (I always go off script…but it’s close!). Enjoy! Good morning and Happy Reformation Sunday! My name is Sara Wilhelm Garbers. I am the Director of Admissions at Luther Seminary in St. Paul, MN. So here’s the recap in case you don’t know…Luther’s 95 theses were written in response to the Catholic practice of selling pardon (indulgences) which absolved the living and the dead of their sins. It was, essentially, a tax levy to finance the buildings and other needs of the church. For Martin Luther this practice was appalling because if flew in the face of gospel of grace that had transformed Luther’s life. Luther was a man keenly aware of his own sin. He had tried everything to free himself of the guilt he felt. So imagine when he read the passage which says: “21 But now apart from the law the righteousness of God has been made known, to which the Law and the Prophets testify. 22 This righteousness is given through faith in Jesus Christ to all who believe.” He read this book and passages such as the one from Romans 3:19-28 he experienced a freedom he had never known…that grace is a gift of God…not something that may be bought or earned. This changed his life: God’s grace was a gift! And so he wrote his theses to say: “Church…come back to the message of this gospel of grace! Turn anew to the power of the cross.” Luther didn’t think he would start a revolution when he wrote his letter, rather it was just about faithfulness to a gospel which propelled and compelled him forward. This gospel of grace change him and he had no choice but to respond. This was a significant moment that launched forward the protestant faith. And today we remember the power of this legacy of faith. Well, I’ve already anticipated your question, and here’s what I want to say: On that eve of all Saints Luther did something that happened long before he was born and continues to this day: he lived reformation! Luther wasn’t a hellfire. He saw what he wrote as a scholarly critique. Indulgences violated the heart of the gospel to him; for him there was no other option. He had come face to face with the gospel and it forever changed him. The question I have for you today…what is your reformation? You know this deep within yourself…it is the place of deep grace where God has shown up and transformed you. For you this may be when you, like Martin Luther read that all under the law have been saved by grace through faith…and you knew a deep freedom that God didn’t want or need your perfection; but that you were already wholly loved as the sinner and saint. Perhaps it was understanding a gospel call to care for the widow and orphan that has demanded you to move into work of solidarity. Perhaps it was knowing you are loved by God…that you are held in God’s grace. Where has this gospel of grace intersected with your story and left you forever changed? So today we don’t celebrate death or a static point in history…we celebrate the long, living witness of people who have lived out a response to the grace of God in Christ. We celebrate a baptism and a God who is still at work and still moving. So what is your reformation? What are your theses? What do you write for or against? What rises up in you that you must speak about…these are your reformation moments. And today reminds and invites us all to take our our pens…to pick up our phones and tweet…to do whatever wherever we can to speak out what the gospel has called us to live out. Today is your invitation to reformation. I can hear you: “Sara, that’s nice. The reformation is still happening…but Sara, you just don’t understand, I’m not Martin Luther.” Right…cuz I thought you were? 🙂 But here’s the thing…the world doesn’t need another Martin Luther; he already lived. It doesn’t need another Paul to write the book of Romans. It doesn’t need another MLK Jr. or a Ada Marie Isiaz Diaz…these saints have already gone before us. What we need as a community of saints is for you to respond to the gospel of grace that illuminates the world with more grace. It may be working for immigration reform. It may be opening marriage for all. It may be solidarity with those most forgotten. In it she told the story of Argula von Grumbach. She was a woman who lived out the reformation as well. Though you may not know her name, it doesn’t make her contribution less important. For history does not remember everyone’s names…yet we stand on their shoulders. And even those who history remembers well…are they not also human? Do you think that Luther did not wrestle with his own vocation? He was beleaguered by demons and agonized over if he was moving forward in the ways God would desire. When he penned his theses I guarantee that he never imagined that we would be here today celebrating Reformation Sunday. And this is the reformation narrative…it is of a people who live out faithfully a response to God’s grace. This is the story of both the named and the unnamed. Reformation is being faithful to our vocation. It is found in our responses to the gospel in our midst and our speaking boldly the truths that rise up within gives the world more hope and courage. The gospel had so transformed Luther he believed that the scriptures should be in the hands of all people…this changed the world. So who are you to not live out the good news and to live reformation? “Ok Sara,” you say, “The reformation is happening still and maybe I am a part of it, but what if it is hard?” I hear you. So often is! When Luther wrote his theses he didn’t suddenly become a person with statues and a religion named after him. He was censured, risked loosing everything, including his life. He had the pope writing against him. No big deal, right?! But reformation reminds us that we are not alone. When Luther went and nailed his theses on the door he didn’t do so just as one man against the world. On the eve of all Saints he, in concert with the witness of those living and dead, spoke. I had the opportunity to hear Bishop Hofstad of the Southwest Washington Synod speak on Friday. He said that the term “Lutheran” was actually a term of ridicule meant to mock people who stood with Luther. And you may know what is has meant to be called names or to be pained to the point of death. You are not alone. There is a great cloud of witnesses who stand in solidarity with you. It is then your invitation to take the names you have been called and to reclaim them to live out faithfully our own reformation story. This is an invitation to reformation: to the places deep within where you know you have a call to speak the gospel’s invitation. 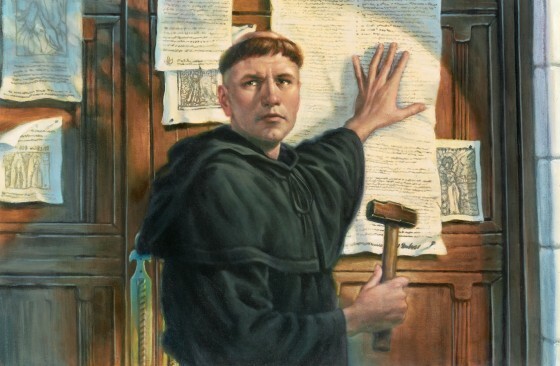 What are your 95 theses? And you, you and I together, with the whole of history have this invitation. It is not only for the names remembered by history, but it is the call and vocation of each one of us and you are living in a time where you voice might be heard around the world. If we but only would speak out together the good news of justice and love and grace might be heard. And this journey will not be easy, but we have each other and we have the promises of a God in whom we live and move and have our being. The world is waiting for reformation. May you live out the reformation today. And may this God of grace, compel and sustain you both now and always.